100 Earth friendly Christmas cards to celebrate the Australian festive season. Show your valued Clients and staff how much you value them, and the environment by sending beautiful Christmas cards made in Australia from 100% post-consumer recycled paper and printed carbon neutral with vegetable based ink. The cards come with natural, 100% post-consumer waste envelopes. 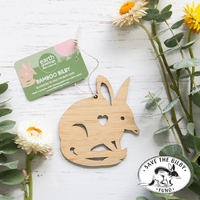 Earth Greetings donate 10% of all profits to a range of environmental organisations including Trees For Life. Earth Greetings sponsorship of Trees For Life has directly enabled them to plant over 40,000 native tree seedlings since 2008. Designed by Sydney based artist Andrea Smith, these charming Christmas cards feature koalas, kookaburras, kangaroos and other native animals. This set includes 50 each of 2 card designs with envelopes, Wishing Tree and Festive Woodland. Card size is 155 x 110 and they are blank inside for your message. Supplied flat so you may print your message and logo inside the cards before folding. Please let us know if you would like us to obtain a quote for you through our local digital printer who is experienced with our cards. Please note - This pack is already offered at a discounted price so no further discounts apply.